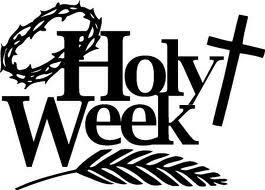 Holy Week is the final week of the season of Lent that commemorates the culmination of Jesus’ earthly ministry i n his first coming. By the fourth century, it had become the high point of the entire annual liturgical calendar of Christian festivals and seasons with the greatest concentration of special services during the entire year. Such services recounted the spiritual meaning and implications of such events as Jesus’ triumphal entry into Jerusalem (Palm/Passion Sunday), his establishing the Lord’s Supper at a Passover meal with his disciples (Maundy Thursday), his death on the cross (Good Friday), and his resurrection from the dead (Easter Vigil on Saturday night, and Easter Sunday, which initiate the season of Easter). For more resources on the history of Holy Week as well as devotional materials for worship, see the Holy Week page under the Liturgical Calendar tab at the top of the page. This entry was posted in Holy Week, Liturgical Calendar by Mike Farley. Bookmark the permalink.